While it is nice to think that everything available to consumers has gone through rigorous testing to ensure that it is 100% safe, unfortunately that is not the case, especially in America. Our blog post on chemical-free living already discussed how chemicals are added to products for purposes like preservation and fragrance and how they can accumulate in the body. Of these chemicals, one class in particular has been shown to have detrimental health effects, impairing thyroid function, causing reproductive issues, decreasing fertility, and even contributing to certain types of cancer. Eat organic foods: Organic foods are raised without pesticides, herbicides, fungicides, or genetic modification, and the environment in which they are produced must meet strict guidelines as well. By choosing organic foods you're steering clear of both pesticides and other chemical residues that can be found in their non-organic counterparts. Eat whole foods: Xenoestrogens in the linings of cans and other packages can leach into foods, so opt for ingredients that are whole and fresh instead of pre-packaged. Choose glass over plastic: Store and reheat food in glass containers and use glass or stainless steel water bottles instead of plastic. 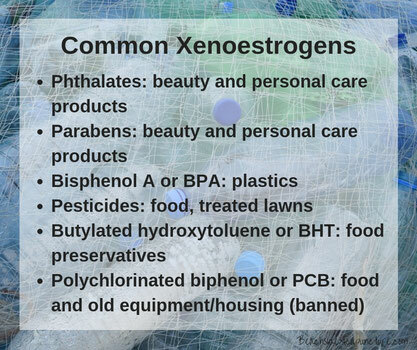 Xenoestrogens in plastic and styrofoam can leach into food and beverages, especially when heated, so avoid them as much as possible. Use natural cleaners: There's a reason your favorite cleaning solutions have danger warnings all over them! Choose plant-based options or make your own cleaners using ingredients like apple cider vinegar - look through our Pinterest account for ideas - and toss the poisons. 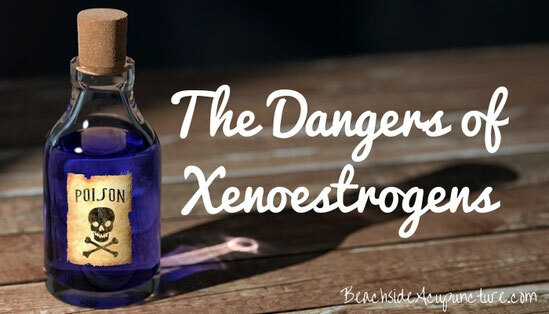 Even if you're not dealing with an issue directly impacted by xenoestrogens (i.e. fertility), it's still in your best interest to avoid them as much as you can. While completely eliminating them may very well be impossible, by following the tips in this post you can significantly reduce your exposure. Decrease the chemical load you place on your body and it will have more energy and resources to detoxify and rebuild within itself, which will lead to better overall health. **Polychlorinated biphenol or "PCB" was banned in the late 1970's but may still be present in older homes and still impact the environment and subsequently our food supply.